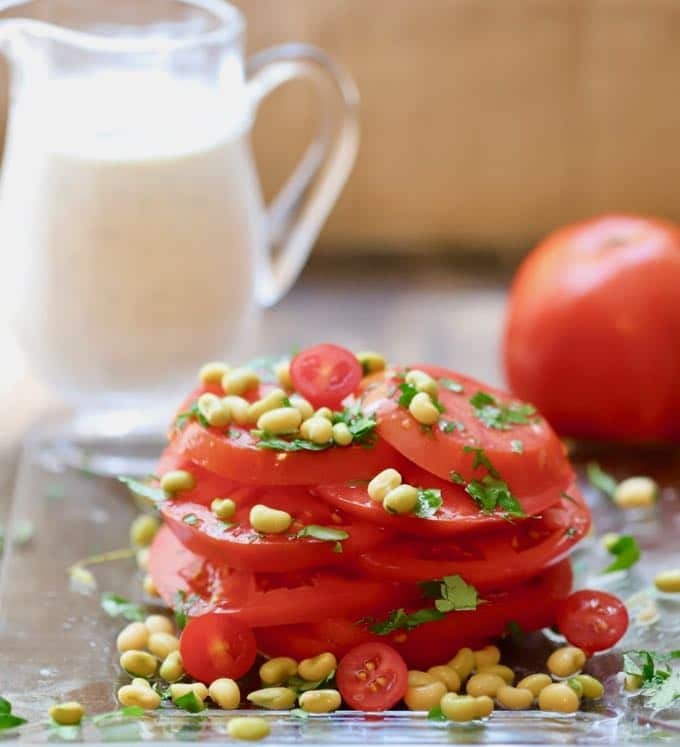 Tomato Salad with White Acre Peas was inspired by the impressive Hot and Hot Tomato Salad which is served at the Hot and Hot Fish Club Restaurant in Birmingham, Alabama. Friends of ours, Mike and Martha, were visiting their son John in Birmingham recently, and he took them to the Hot and Hot Fish Club Restaurant. They raved about the food, especially the Hot and Hot Tomato Salad and mentioned that there was a Hot and Hot Fish Club Cookbook. Since I love cookbooks, especially cookbooks that include stories along with the recipes, this was music to my ears, and my order was soon flying through cyberspace on its way to Amazon. I have to say, this cookbook is fabulous, and if you enjoy cookbooks as I do, you will love this book! 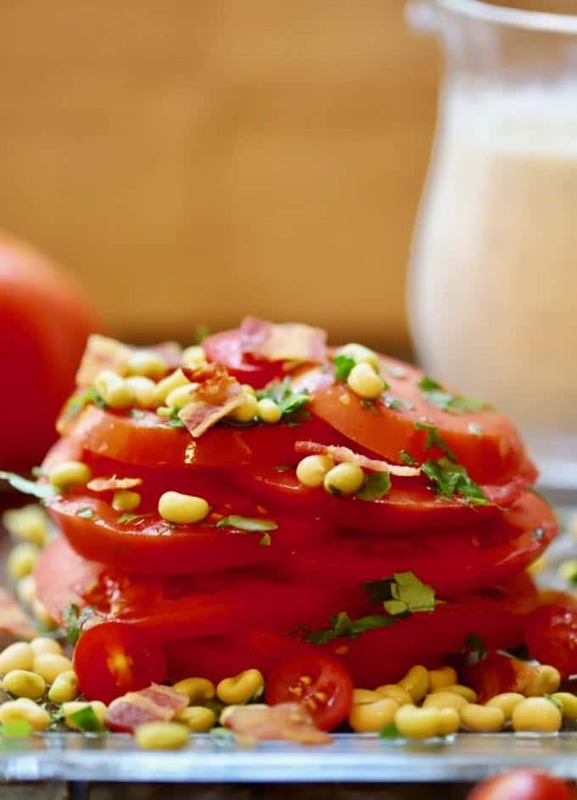 Once I saw a picture of the Hot and Hot Tomato Salad that Martha raved about I knew I had to try my hand at making a simplified version of it to share with you. The Hot and Hot Tomato Salad is much fancier and grander than my simple Tomato Salad with White Acre Peas and includes whole fried baby okra, several varieties of heirloom tomatoes, bacon, fresh cooked corn and white acre peas, and it’s topped with a balsamic dressing and their chive dressing. My humble salad features fresh large beefsteak tomatoes, cherry tomatoes, fresh white acre peas, bacon, and a delicious homemade blue cheese dressing. It may not be quite as grand as theirs, but it is healthy and delicious and full of fresh, flavorful tomato goodness! It’s also much quicker and easier to make. If you like salads, you might also like my Romaine Wedge Salad with Green Goddess Dressing, Spinach Salad with Strawberries and Pecans, and Easy Broccoli Slaw with Ramin Noodles. Need more ideas? 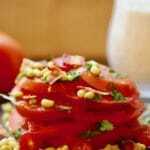 Click here for a list of all of my salad and dressing recipes. 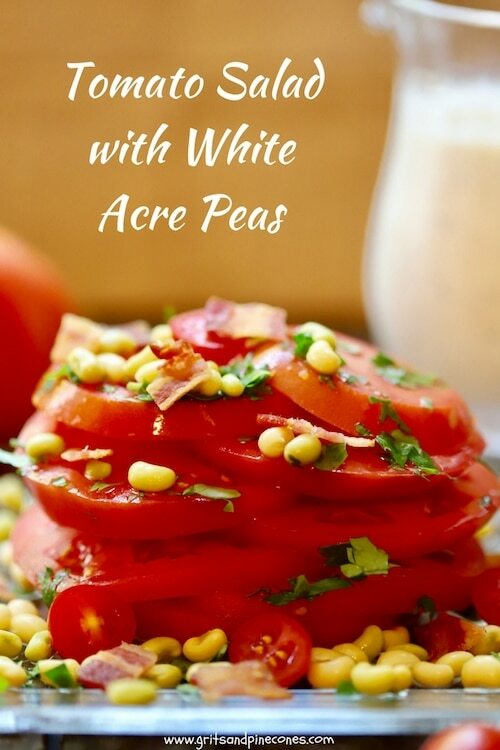 While you could eat this tasty salad for a light lunch or even dinner, my Tomato Salad with White Acre Peas is a perfect side dish and would pair beautifully with just about any entree for a quick weeknight dinner. It also would make a stunning presentation to serve to guests. It’s easy to assemble and full of fresh flavors. I hope you try it soon while fresh tomatoes and white acre peas are still available at the farmers’ markets. 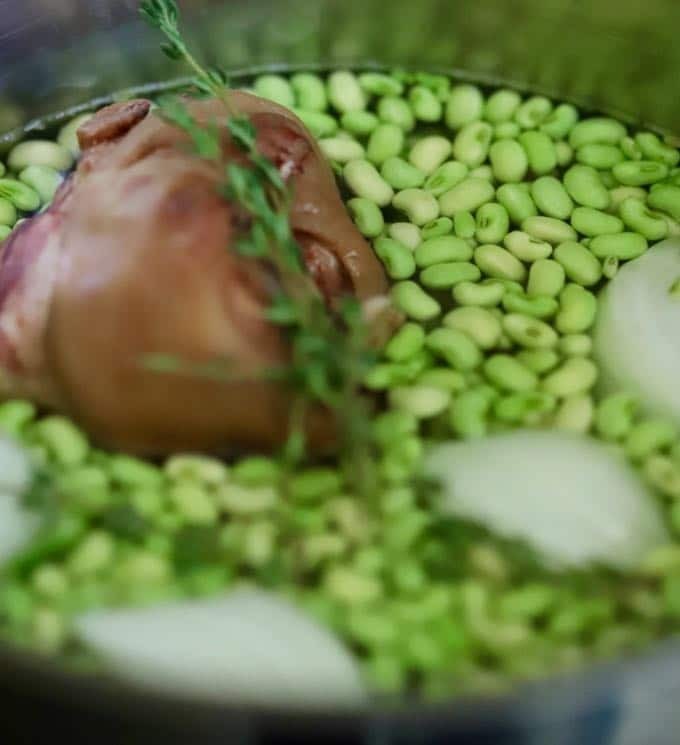 To cook the peas, add the ham hock, peas, thyme sprig, kosher salt, and pepper to a small saucepan over medium-high heat. Add just enough water to cover the peas and bring to a boil. Reduce the heat to low and let the peas simmer for about 15 minutes or until they are just tender. The fresher the peas are, and the smaller they are, the less time they will need to cook. When the peas are done, remove from the heat and drain. Set aside. 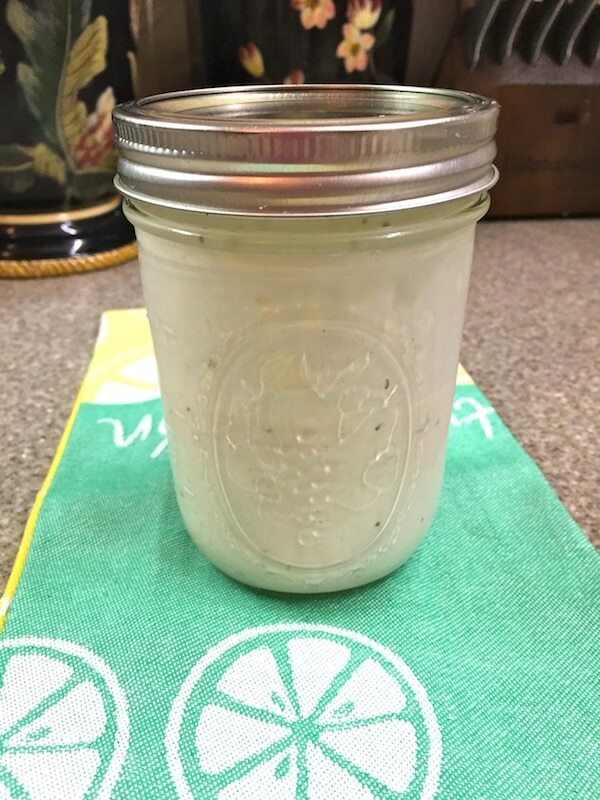 To make the blue cheese dressing, add the blue cheese crumbles, sour cream, buttermilk, mayonnaise, white wine vinegar, Worcestershire sauce and black pepper to a mason jar and shake well. Refrigerate the dressing until you are ready to use it. *Notes: You can substitute a package of dry ham flavored concentrate made by Goya for the ham hock. 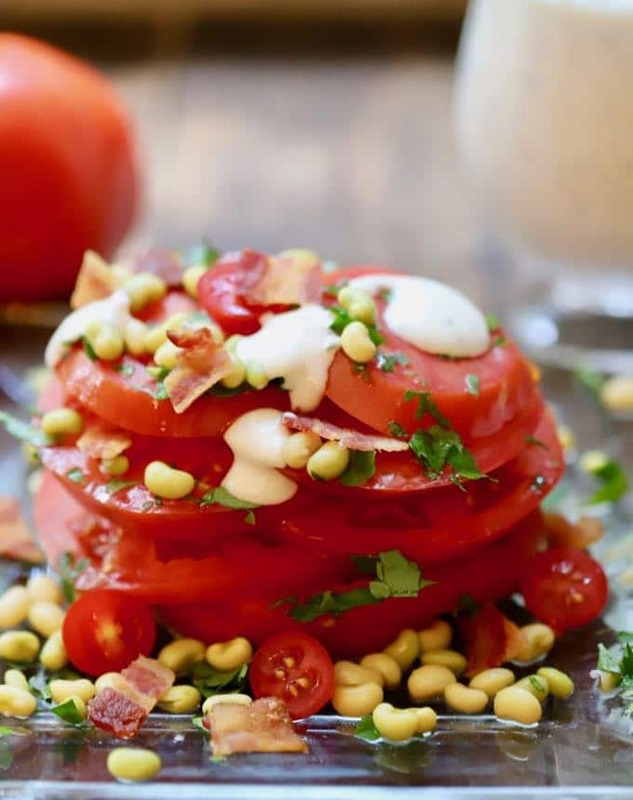 Easy Tomato Salad with White Acre Peas is full of fresh tomato goodness with two kinds of tomatoes, white acre peas, bacon, and homemade blue cheese dressing. This salad sounds amazing, will have to try it. I’ve seen that book, it sounds like one I would like. Would love to take a look at yours when it’s convenient. It is amazing! I even think WEH would like it! Of course, you are welcome to borrow the book anytime! My guess is just as soon as you look through it you will decide you have to have it too!